The Counter Extremism Project (CEP) reports weekly on the methods used by extremists to exploit the Internet and social media platforms to recruit followers and incite violence. Today’s edition shows the 27 different websites ISIS utilizes to upload its terror propaganda and reports on the neo-Nazi forum Fascist Forge. On January 23, ISIS released a new video from the group’s self-proclaimed province in Somalia. Titled “Men Who Have Been True,” it commemorates extremist fighters killed in Somalia and includes footage of a man identified as a Canadian, Dr. Youssef al Majeerteyn. Dr. Majeerteyn urges viewers – and health care workers, in particular – to travel to territory held by ISIS. He also describes efforts by ISIS in Somalia to provide medical care and food aid to the local community. The video is a clear effort to urge potential foreign fighters to look outside of Iraq and Syria. The video was released one day after the Department of Justice (DoJ) announced that three Michigan men, Mohamud Abdikadir Muse, Muse Abdikadir Muse and Mohamed Salat Haji were arrested, one for attempting to travel and join ISIS in Somalia, and two others for aiding in the endeavor. According to the DoJ, all three men pledged their allegiance to ISIS and two had considered committing attacks in the United States. Prior to attempting travel to Somalia, Mohamud Muse had posted pro-ISIS photos and videos on his Facebook page. Mohamud Muse and Mohamed Salat Haji shared and discussed ISIS propaganda videos. In addition to Telegram, the video was released on at least 27 websites: ok.ru, filefm, Google Drive, Google Photos, the Internet Archive, YouTube, Sendvid, Dalfak.com, Mediafire, yadi.sk, the Microsoft One Drive, Amazon Cloud Drive, 3rbup, Anon File, Top4top, mail.ru, Dailymotion, Mega.nz, Megaup, nofile.io, pc.cd, Tune.pk, upmlf, Vidbom, Vimeo, Dropbox and Vidio. Approximately 24 hours later, the video was still available on nine websites: ok.ru, the Internet Archive, Mediafire, the Microsoft One Drive, 3rbup, Amazon Cloud Drive, Megaup, nofile.io and Vidio. 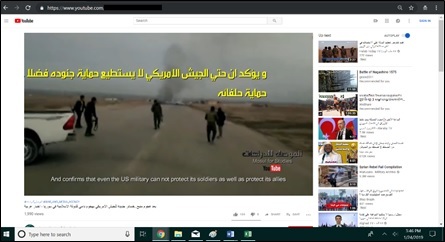 The ISIS video “Men Who Have Been True” on the Microsoft One Drive, January 24, 2019. CEP researchers located a Pro-ISIS YouTube propaganda channel, “Mosul Center for Strategic Studies” (also known as “Mosul for Studies”). The channel was created on November 30, 2018, but only started adding videos on January 16, 2019. As of January 24, the channel has uploaded four videos totaling 11,896 views. CEP first encountered videos from “Mosul for Studies” in mid-November 2018. Not only is “Mosul for Studies” very similar in tone to a previous ISIS YouTube propaganda effort, War and Media Agency, but they both use the same hashtag, “#WAR_AND_MEDIA_AGENCY”. The channel features pro-ISIS propaganda disguised as news reports. One video, uploaded on January 16, features the ISIS suicide attack on American and Kurdish soldiers that occurred that same day. “Mosul for Studies” video on YouTube, January 24, 2019. 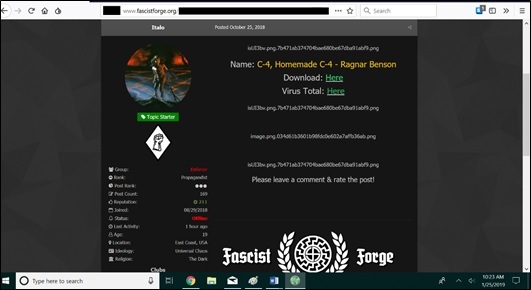 The neo-Nazi web forum Fascist Forge offers guides on making explosives and the craft production of firearms It is an online message board for neo-Nazis and other fascists that follow the extremist writings of James Mason, and in some cases, violence oriented-Satanic groups such as the Order of Nine Angles. While Fascist Forge is not a specific organizing place for the Atomwaffen Division, the site does archive the group’s propaganda posters and links to their propaganda videos. The site also contains propaganda from the British Sonnenkrieg Division. Three of the group’s alleged members were arrested in December on charges including encouraging terrorism, distributing terrorist publications and, in one case, possessing material likely to be useful to a person committing or preparing an act of terrorism. Links to explosives manuals on the Fascist Forge forum, located January 25, 2019. The forum is intended to pick up where a now-defunct forum, Iron March, ended. Iron March notably helped give birth to extremist organizations such as National Action (U.K.), the Atomwaffen Division (U.S.) and Antipodean Resistance (Australia). Fascist Forge also offers propaganda, as well as information on survivalism, firearms, explosives and fascist ideology and philosophy. 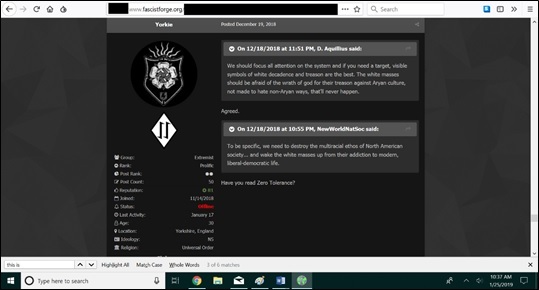 Forum members have discussed tactics for fomenting and fighting a race war through tactics such as lone actor terrorism and celebrity assassination. As of January 25, 2019, Fascist Forge has almost 400 registered members. Fascist Forge’s registrar and name server is Dream Host. Dream Host notably ceased providing services to the neo-Nazi website The Daily Stormer for terms of service violations, and then canceled their account again in 2017 following an attempt to re-register the website. Discussion of violence on Fascist Forge, located January 25, 2019.